Misinformation is an age-old concept that has been around for as long as news itself. Having assumed various forms over the course of history - from propaganda campaigns to spin doctoring - it has once again been cast into the international spotlight, brandishing a new title: 'fake news'. 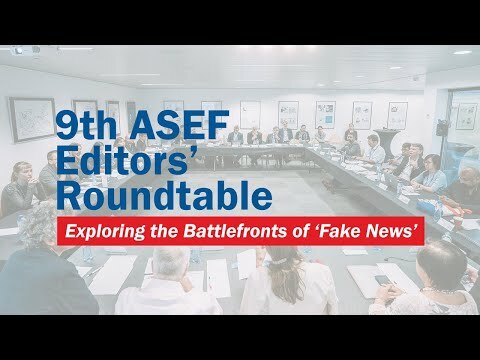 Held in conjunction with the 12th ASEM Summit (ASEM12), the 9th ASEF Editors' Roundtable (ASEFERT9) is the 2018 edition of a 2-day biennial forum aimed at promoting dialogue, strengthening ties and cross-continental cooperation between 20-30 news editors from across Asia and Europe. In recognising the complexities of the issue and the necessity of a comprehensive multi-stakeholder approach, ASEFERT9 will include representatives from news media, policy making, tech companies and civil society to create a robust discussion and provide for diversity of opinion. The intended outcome of the 2-day forum is a detailed report on how 'fake news' is being fought from a tri-sectorial approach in individual countries across Asia and Europe. Through the resulting discussions, a series of country reports as well as an agreement on key principles to further action will be compiled and published for online distribution and submitted to the ASEM governments. This opinion piece first appeared on BlogActiv.eu, the guest blog of EURACTIV. 'Fake news', 'misinformation', 'online falsehoods' – call it what you may, but let us not be mistaken – this is not a recent phenomenon. Neither is it truly a new problem, though arguably it has gained new relevance in today's information society, largely due to the rise of social media. Indeed, fake news has existed in one form or another since antiquity. Propaganda campaigns, 'spinning' and hoaxes can all be considered forms of disinformation, even if its exact definition is debatable. The ambiguity surrounding the term 'fake news' is the first obstacle to what makes it so hard to tackle. The term means different things to different people. For example, a politically polarised society can create segments of population that adhere to such differing realities that the word 'fake' itself can end up being subjective. In 2016, the phrase 'fake news' was mainly used to describe a social media phenomenon. Since then, it has rapidly evolved into a journalistic cliché, a political slur and, in some places, deemed a matter of national security. That is why the Asia-Europe Foundation prefers to enclose the term 'fake news' between inverted commas. Before a commonly agreed definition is settled upon, it is more prudent to declare that our understanding of the term is limited. This limited understanding, however, can be expanded upon through exposure to a diversity of perspectives. In recognising the complexities of the issue, it is thus necessary to encourage a comprehensive multi-stakeholder approach, featuring, for example, voices from news media, policy making, media technology companies and civil society to create a robust discussion. Many governments have enacted legislation to tackle 'fake news', while news organisations have been scrambling to establish fact-checking desks and self-regulate – all in an effort to stay credible and independent. Indeed, BBC chief Tony Hall recently warned that the misuse of the term fake news "threatens to damage confidence in journalism". Civil society too has jumped in with efforts to promote news literacy on all levels, as is the case with Lie Detectors' classroom sessions, which promote critical thinking. Media technology companies are turning to tech-based solutions such as AI, while adopting new codes of conduct to counter election meddling. Given the array of different measures and the depth to which 'fake news' affects society on all levels, it is clear that any serious effort to tackle the issue must be a coordinated one, incorporating perspectives from the different pillars of society. This is a principle that underlines the theme of Asia-Europe Foundation's 9th ASEF Editors' Roundtable, as we seek to bring together news editors, policy makers and media technology companies from across Asia and Europe to share experiences on the topic and exchange ideas on how it is being tackled. Furthermore, the issue of fake news has seen worldwide prominence in recent years due to its cross-national implications. With the global press and rampant social media all contributing to a constant barrage of information in today's world, fake news can no longer be treated as a national issue or tackled as such. International conferences and multilateral fora are therefore prime opportunities for the exchange of ideas. The Brazil-EU International Seminar on Fake News: Experiences and Challenges is a notable example of such an international approach to the dialogue on fake news. Indeed, the final report of the EU's High-Level Expert Group on Fake News advocates for cross-border research into the scale and impact of disinformation. The report, entitled "A Multi-Dimensional Approach to Disinformation", also calls for a collaborative effort that involves all relevant stakeholders. Through case studies and in-depth examples on the various manifestations of 'fake news' and the variety of approaches that are being adopted, our understanding of the topic can be enhanced, and our approaches strengthened. As a global issue, 'fake news' deserves a global approach. What is 'fake news' exactly? Is it a recent phenomenon or an age-old quandary? Our moderator Dr Fraser Cameron introduces the topic and initiates proceedings for the 2-day roundtable. How has 'fake news' affected the fabric of our societies, and why is it so relevant today? Is 'fake news' a social, technological or political issue? We examine the multiple facets of 'fake news' and disinformation. What are the power relations that constitute the communication of 'fake news' through social and mass media? How and by whom are they exercised? Our editors discuss examples across Asia and Europe. From new legislation to technology companies' initiatives and beyond, we examine the various approaches being taken in Asia and Europe. The roundtable concludes with a joint recommendation. Fraser Cameron is Director of the EU-Asia Centre in Brussels, a think tank seeking to promote closer relations between the EU and Asia. He is a former European Commission advisor and well-known policy analyst and commentator on EU and international affairs. Victoria Main is CEO at Cambre Associates, an advocacy and communications consultancy in Brussels. Victoria began her career as a journalist, most recently with Reuters in London, but also in Brussels, Hong Kong, Milan, Paris and Wellington. She holds French and New Zealand nationality. She is a policy communications expert with an international mindset and a far-reaching network in Brussels and beyond. Brussels is a policy town, so it’s unusual for someone with a journalism and communications background to head a consultancy.